Sons Of Magdalene = Joshua Eustis = 1/2 of Telefon Tel Aviv. Simple enough, right? One of the guys from Telefon Tel Aviv (Josh) has a solo project (Sons Of Magdalene). I found out about this little project of his because he had some info on his MySpace regarding Belong's Colorloss EP, which was mixed in Josh's studio. I listened to the one track he had on his page, "Quartet For Erhu And Tape," and immediately added him as a friend, waiting for him to announce any sort of release. Well, that day came, just over a week ago. I placed my order (which you can also do, info right here) and received my limited edition, hand numbered CD-R copy (number 8 ftw!) of Ephemera yesterday. Hooray! I love it. It's gorgeous and beautiful. And you know what it sounds like? It sounds a helluva lot like Belong. Which is certainly not a bad thing. Actually, the world could use a lot more music that sounds like this. Ephemera has two tracks, both similarly titled (something in French about men and women) and they're both long enough to develop sonically (about 20 and 17 minutes) but just short enough so that it leaves me craving more. The first one, "Pourquoi Tous Les Hommes Sont-Ils Des Laches?" sounds more like Belong, while the second track sounds more like William Basinski. And I'd say being compared to those two puts you in very good company. I believe his technique is to record a live orchestra on tape, and then process and loop the tape. It definitely has that looped tape sound, much like William Basinski, who I know is a major influence on Belong (have you ever compared "Who Told You This Room Exists?" to any of the Disintegration Loops? ), and must be for Eustis as well. And since I'm such a fan of both Belong and Basinski, I have immediately fallen in love with Sons Of Magdalene. 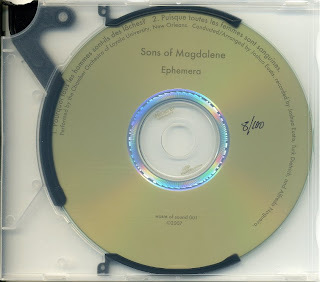 However, sometimes while listening to Ephemera, I feel like I could easily be listening to either Belong or Basinski, which isn't necessarily a bad thing, but maybe Sons Of Magdalene needs to distinguish itself a little bit more. I know these are (I think) only his third and fourth recorded songs, so it's possible he just needs a little more time in the oven. I have no problem with that, given that he releases all of his future work. I would be very interested to follow Sons through an illustrious and prolific career of gorgeous tape drones. From the sounds of it, I'm sure it would be a good time. I would love to give this a listen, but sadly I found out about it after it had already sold old. Congrats on an excellent find. I think this project holds a lot of promise. I highly recommend the remix of clocks "Sons" did for aus. Very good as well. Well, now that it's sold out, I guess it wouldn't hurt if I threw this out there. I'll upload it in a couple of days to Media Fire and add a link to this post. I have recovered faith in humanity. 10,000 thanks for sharing this. The most incredible experience is having a band and recording in the studio should be terrific I'd be so happy doing something like that, and most gratifying result the accomplished album at the end. I guess it wouldn't hurt if I threw this out there.